For years, people have been curious about how service and therapy dogs help PTSD vets. Perhaps you’ve spotted a service dog assisting a disabled veteran at the supermarket or a friend might have told you how a visit by a therapy dog at his hospital bed brightened his day. Whatever the case may be, these dogs play very important roles in the lives of the people who need them. In case you didn’t know yet, PTSD or Post-Traumatic Stress Disorder is a mental illness that affects individuals who have experienced or witnessed harrowing events at some point in their lives. A person who’s been diagnosed with PTSD exhibits debilitating symptoms such as nightmares, flashbacks, hypervigilance, sudden mood swings, panic attacks, difficulty in social settings, and uncontrollable thoughts that are associated with a particular event. Although anyone, regardless of age, can have PTSD, this is more common among former military servicemen and women who have gone through various traumatic experiences during combat or during training or even in times of peace. Data show that 11 to 20% of veterans who served during the Operations Iraqi Freedom and Enduring Freedom have PTSD. Moreover, 12% of Gulf War vets and 30% of the Vietnam war vets have had PTSD within their lifetime. In 2014 alone, it was reported that 20% of the veterans who had PTSD eventually took their own lives. Suicide is prevalent among vets who are struggling with depression between the ages of 18 to 29. How Can Service and Therapy Dogs Improve a PTSD Vet’s Life? Since time immemorial, dogs have always been man’s best friend. If you have a dog at home, you have a warm paw to hold, a running buddy, and a listening ear. However, a PTSD vet who finds it difficult to return to his normal life before the traumatic event occurred will need more than a regular dog for a constant companion. They are not pets but are highly trained canines that have been carefully selected by breed for their calm demeanor, solid temperaments, handler focus, and their ability to serve under pressure. They provide a sense of security to PTSD vets around the clock. Their ability to work in public places such as restaurants, hotels, churches, libraries, and grocery stores is protected by federal and state laws. They perform specific duties for their owners such as ensuring that their handlers are taking medication, interceding when their owners are having panic attacks, patrolling the perimeter for any signs of danger, warning their handlers about situations that can potentially trigger a flashback, keeping people from crowding around their owners, prevent future issues such as substance abuse and more. These dogs are experts in providing psychological or physiological therapy and are trained to interact with other people while they are on duty. The comfort and affection they provide to PTSD vets help reduce the incidence of depression, suicidal thoughts, violence, drug use, alcoholism, and serious mental and emotional breakdowns. Unlike service dogs, they cannot live in housing that allows no pets, they have no access to public areas unless they’re invited, and they can’t join their handlers on flights for free. However, their calm temperaments give them the ability to visit high-stressed environments such as nursing homes, hospitals, courtrooms, and airports. 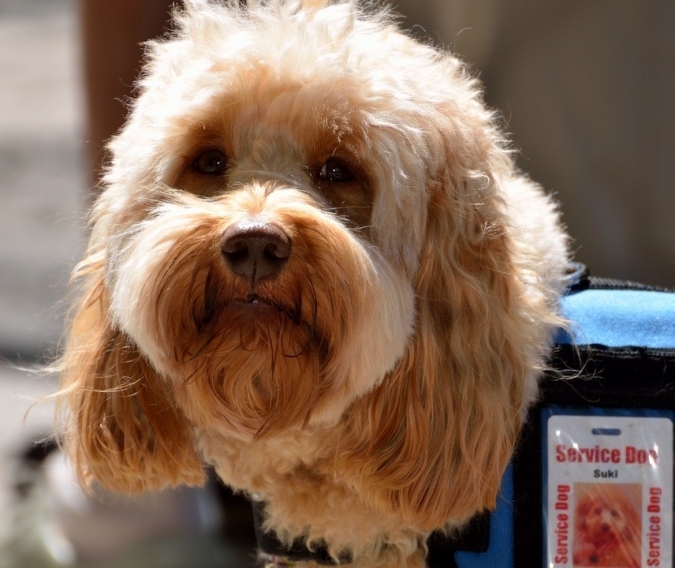 Service and therapy dogs have unique skill sets that help them perform their critical roles in the lives of the people they serve. Knowing and understanding these specific roles and the work that they do for the benefit of PTSD vets is extremely important. Aside from service and therapy dogs, another sure-fire way of providing assistance to PTSD vets is by donating a car to us at Veteran Car Donations. The money generated from the sale of your charitable contribution will be used to fund charity programs that provide free mental and physical health care, mortgage-free specially adapted housing, job opportunities, scholarship, and other benefits for former military servicemen and women. To know more about Veteran Car Donations, our fast, simple, and convenient donation process, the tax deductions and other rewards you’ll get, the types of vehicles you can donate, and other related matters, check out our About Us and FAQs pages. You can also call our toll-free 24/7 hotline 877-594-5822 or contact us online for your inquiries. Call us at 877-594-5822 to get started with your car donation!